Ghost stories tend to work best as short stories rather than as novels. Or, at best, as novellas, such as The Turn of the Screw. The reasons for this aren’t hard to discern: the point of a ghost story is to evoke fear – to create in the reader a state of mind that is susceptible to suggestions of supernatural terror; and so delicate and fragile is this state of mind, so easily destroyed by even the slightest intrusions of reality, that it becomes virtually impossible to keep it intact across the span of a full-length novel. John Harwood is aware of the difficulty in his first and much-acclaimed novel The Ghost Writer. He solves it in part by interpolating into his principal narrative various short ghost stories, purportedly written by the deceased great-grandmother of first person narrator. These ghost stories, we are told, may or may not be related to a dark mystery at the heart of the principal narration. But here, we run into a problem: to maintain the principal narrative over nearly 400 odd pages, Harwood has to present it as something other than a ghost story: he chooses to present it as a mystery story. And, while the ghost story and the mystery story may superficially appear to have much in common, they are very different beasts, and make very different demands. A mystery story is essentially all about plot. The author may create a strong atmosphere, but ultimately, the whole point is to tantalise readers with unrevealed elements of the plot, and to reveal these elements by the end. The enjoyment is in the unravelling of the plot, and once the plot is unravelled, it is of no greater interest than is a completed crossword puzzle. But plot generally counts for little in a ghost story. Indeed, many of the finest of ghost stories are virtually plotless. And, far from resolving issues by the end, a good ghost should deliberately leave at least some of them unresolved, or merely hinted at, to ensure that a sense of unease lingers even beyond the final lines. Neat explanations that are essential for a satisfactory conclusion of a mystery story can completely destroy a ghost story; the rationality that resolves mysteries is grotesquely out of place in a context in which it serves but to destroy the fragile susceptibility to supernatural terror. John Harwood treads a skilful line between the competing claims of the two genres he is attempting to combine, but, looking through various readers’ reactions across the net, I do strongly get the impression that fans of the mystery genre were unhappy that not all plot details were clearly explained, while aficionados of the supernatural genre were unhappy that too much was revealed. Well, you can’t please everyone, I guess, but when two genres have such different criteria of success, it’s possibly best not even to try to combine them. However, it must be conceded that the mysteries at the heart of the novel are intriguing; and that the sequences of supernatural terror, when they come, really are quite spellbinding. The interpolated stories are variable: M. R. James has been evoked, but he always is evoked when creepy old-fashioned ghost stories are being discussed. Tthe comparison, it must be said, does Harwood no favours, but that’s hardly a disgrace: M. R. James is, after all, almost universally considered the master of the genre, and there is no reason why every practitioner must be compared with the best. But, leaving M. R. James out of it, the short stories interpolated by Harwood into the principal narrative are, on the whole, rather good: I particularly enjoyed one set in the Reading Room of the British Library, and featuring a deeply sinister doll. However, at the centre of the novel is interpolated not a short story, but a novella – “The Revenant”, some 70 pages long – and here, I was less convinced: as ever with narratives of any length, it is very difficult to focus on ghostly matters over the entire span, and so the author has to focus on other matters; and here, John Harwood – or, if you prefer, Viola Hatherley, the fictional author of this story – focuses on the characters, and on the relationships between them. However, since the characters are rather two-dimensional, I found it, I must admit, rather dull: it is hard to be interested in a story of sibling rivalry involving two cardboard cut-out sisters. This is, I admit, a problem I often have with much popular drama, and popular literature: I really can’t be bothered with the relationships and dramas of characters who are little more than their names. Is Beatrice the nasty one, or is it Cordelia? Which one does Harry really fancy? Why do they all have Shakespearean names? Do I care? To be fair, this longueur doesn’t last long: after “The Revenant”, we enter into the finest part of the novel, in which the narrator is in London, determined to find out the family secrets his mother had hidden from him. And we are introduced at this stage to that venerable, time-honoured element of a ghost story – an old, abandoned house. Not that there is anything wrong with that: the ghost story is quite a conservative genre, and its effect depends not on introducing radical new elements, but, rather, on doing established things well. And John Harwood does it supremely well. There are several scenes set in that old house, and Harwood very skillfully tightens the tension just that bit further with each successive scene; and the final sequence seemed to me superbly carried off. I wouldn’t recommend reading this section of the novel when on one’s own late at night. So, despite a few reservations – mainly due to my personal lack of interest in the mystery story genre – I did enjoy this: towards the end, I enjoyed it greatly. Harwood’s follow-up to this novel is The Séance, which, I gather, is a mystery story with supernatural trimmings. It’s a shame he has gone in that direction. Let’s hope that he returns to the full-blown ghost story; and that, this time round, he writes a collection of short stories rather than a novel. Every now and then, Radio 3 devotes a few days of its schedules mainly, or even wholly, to the works of a single composer. Bach, Mozart, Beethoven and Chopin have all been given this treatment, to the great joy of their respective fans, but to the chagrin of certain killjoys who apparently find it too difficult to listen their CD collection for a while if they do not particularly care for what is on the radio. Right now, it is Schubert who is receiving this Radio 3 treatment, and I, for one, couldn’t be happier: Schubert’s music has come to mean much to me over the years. It’s hard to speak about Schubert without speaking of his tragic early death – he was only 31 when he died – and of the shadow of death that haunts so much of his finest work. This inevitably leads to arguments on the extent to which our knowledge of the artist’s life should influence our reaction to his work. The answer to that question is, obviously, “not at all”: a work stands or falls on its own terms. But even if we knew absolutely nothing about Schubert’s life, even if we were to judge his works purely on their own terms, we would still, I think, be detecting in them that death-haunted quality. Not, of course, that it is all doom and gloom. Very few composers have communicated the sheer joy of living as exuberantly as Schubert has done – even, sometimes, in some of his very late works. But joy in life is not incompatible with awareness of death: indeed, the two often go together, as awareness of the eventual loss of one’s life is all the more affecting when one loves that life deeply. That is at least one reason why the grave doth gape thrice wider for the likes of Falstaff than for other men. The grave certainly gaped wide indeed for Schubert. That is not merely a fanciful reading: music, of course, is abstract, but there is little abstract about so many of the texts Schubert chose to set to music. The early song cycle, Die Schöne Müllerin, so full of the joys of living and of loving, so replete with the sounds of nature, turns insidiously towards darkness; while the later song-cycle Winterreise is effectively music to slash your wrists to: the darkness is there from the beginning, and by the end, even the consolation of death is denied. Somehow, even the most angst-ridden of music by other composers can seem insipid in comparison. Compared to the Schubert of Winterreise, Leonard Cohen appears quite a jolly old chap. And the instrumental works also: music may be abstract, but I doubt there are too many who could listen to, say, the C minor piano sonata, or to the string quintet, and come away thinking they are jolly, happy works. They have happiness in them, sure: Schubert was no monomaniac. But the sense of a deep, impenetrable darkness is never too faraway. Of course, there’s more, much more, to Schubert than this. Ask anyone who loves Schubert what draws them to the music, and, regardless of how learned or otherwise they may be in musical matters, one thing they are all bound to mention is his extraordinary gift for melody. Oh, other composes have excelled in melody as well – Handel, Mozart, Verdi, Tchaikovsky, Gershwin – but no-one quite equalled Schubert in this respect. And it is impossible to explain why. What is melody, after all? A sequence of notes played to a particular rhythm. So what is it that makes certain sequences of notes so much better than certain others? It is an impossible question to answer, and remains one of the great mysteries in life: we simply do not know, and, I guess, never will know, just why it is that a succession of pitched sounds can exert so powerful an effect on us. Analysts may examine what features make for good tunes, but not even the most powerful computer programme armed with all the fruits of such analysis could create a melody that touches the soul so deeply as do so many of Schubert’s. Just listen, for instance, to the melody of the song “Du Bist die Ruh”; or to that second theme of the string quintet, or of the “Unfinished” symphony; or to the serene opening of the B flat piano sonata; or to that heartbreaking theme of the slow movement of the B flat piano trio; or to dozens of others that occur so easily even off the top of one’s head. Art, I realise, is not a competitive sport, and there is little point in creating league tables, but when it comes to putting together tunes, there really is no-one who could match Schubert. It’s not just melody, of course: I have not had a musical education, and would be very embarrassed even to try to speak of such matters as harmony: I do not know, for instance, just what the modulation is towards the end of the slow movement of the B flat piano sonata; but I do know the effect that modulation has on me, even on repeated listening when I am expecting it. It has the effect of a window suddenly opening on to a new world. And Schubert did this sort of thing so often! So, if one had to pick a favourite work by Schubert, what would it be? An impossible question to answer, though various musical luminaries offer their thoughts here. Recently, I have been listening almost obsessively to Schubert’s last string quartet (No 15 in G major, D887): it is a work of deep unease, and, despite passages of the most exquisite lyricism, ranges in mood from melancholy to sheer, unadulterated terror: it is a work that has a curious and inexplicable hold on me. But in the last few days, I have found myself listening increasingly to Schwanengesang, which is a collection of his last songs, put together and given that possibly sentimental title after Schubert’s death by his publisher. It is not, strictly speaking, a “song cycle”, although it is easy to see why it is often referred to as such: these are songs that simply ache with loss and yearning and desire. Even the song “Der Taubenpost”, which has the most delightful of melodies and which bounces along quite happily, focuses poignantly near the end on the word “sehnsucht” – “longing”. At the heart of this collection are settings of six poems by Heinrich Heine, and they are so haunting that I swear I have heard them even in my sleep. One of these songs tells of a parting by the sea: we do not know who these people are, or why they are parting, but in the final line, the singer tells us that he drunk her tears, and, ever since, has been poisoned by them. Another song tells of a portrait of which appears to come to ghostly life. And in “Der Doppelgänger”, the climactic song of the sequence, and one in which this greatest of melodists appears to abandon melody altogether, the singer returns to the place where his love had once lived but now lives no more, and, in a moment of sheer terror, sees the ghost of his own younger self, mourning his loss. These songs seem to take us into some mysterious hinterland of the mind, and reveal an emotional landscape that is unlike anything I think I have ever encountered. So, can I take a full week of nothing but Schubert? Unlikely. Much of his music is far too intense. But then again, I doubt I’ll have the time anyway to listen to the radio without pause for a full week, But while the Schubert season lasts, I am more than happy to join in the celebrations of the works of one of the greatest and most affecting of all creating artists. Levi’s life & literary career are inevitably defined by his experiences in Auschwitz. His writings on Auschwitz – both autobiographical and polemical – are required reading; if there’s any book that really must be read, it’s If This is a Man. And one should also, perhaps, read The Truce, which describes his long journey back from Auschwitz, and which is, surprisingly, exuberant and life-affirming. Or his last book – The Drowned and the Saved – in which he reflects furiously on the Holocaust. Given Levi’s well-deserved reputation for level-headedness and generorosity of spirit, many readers were shocked by the sheer ferocity of this book, but it served to remind one – should reminding be necessary – there are certain crimes so atrocious that they neither could nor should be forgiven. But is he to write only about the Holocaust? Is it possible for him to address other themes? Here, he addresses a theme rarely addressed by fiction: work. Usually, in fiction, we are either shown people wealthy enough to not have to work; or we are shown people whose work is exciting, or made to appear exciting (soldiers, detectives, etc. ); or we are shown characters during their non-work hours. The truth is that most of us we spend a large proportion of our lives at work, and this is an area that fiction barely touches on at all. People at a desk doing paperwork, analysing data on PCs, mending gas pipes, taking blood samples in clinics … these are usually considered too dull to depict. And yet, work is Levi’s theme. The narrative takes the form of a series of anecdotes, told mainly by Faussone, a rigger. (Faussone, Levi explains in an afternote, is a fictional character, but is an amalgam of various real people he had known.) In various chapters, Faussone tells us of the various jobs he has had around the world, often going into technical details. And, after a while, this job which he carries out to earn his pennies emerges as nothing less than heroic. And, much to our surprise – much to my own surprise – we find ourselves caught up even in what may atfirst sight appear to be dry, technical details. Towards the end, Levi gives us a couple of stories relating to his own job (he was a professional chemist). It’s a very different job from Faussone’s, but it is clearly a job he loves. And once again, the details of his work, though presented in Levi’s characteristic down-to-earth tone, emerge as curiously compelling. And at this point, anothertheme seems to emerge: Levis’ other job – that of a writer, and the conflict between the two vocations. Loving one’s work, and being good at one’s work, is, Levi says, one of our great “freedoms”. I was struck by his use of the word “freedom” in this context, but I think I see what he means: if our work is mainly a chore to be put up with, or even something we dislike, then we are chained: freedom only comes from liking what we do. But it is a freedom that, perhaps, not too many people enjoy. For those readers used to Levi’s memories of and reflections on Auschwitz and the Holocaust, it is too easy to say that this theme is slight. But I don’t think it is. Levi was a heroic man in every sense – physically as well as morally – but it is unreasonable to expect him to write solely about the Holocaust. This very short book was a wonderful and refreshing surprise. Perhaps it will always remain under the shadow of his books on the Holocaust, but it doesn’t deserve to. Ghost stories are incredibly difficult to pull off. One must maintain throughout a judicious balance between telling too little, and telling too much: tell too little, and the reader feels cheated; tell too much and the sense of mystery, of the unexplained – that sense which is the essence of any good ghost story – dissipates. And the pacing has to be just right: any slight misjudgement in pacing that may pass unnoticed by most readers in other types of fiction can sink a ghost story. I know: I speak as one who has tried his hand at writing ghost stories, but who has been so embarrassed by the results that he has not even kept them tucked away on his hard drive. None of this prevents there being an entire library of great ghost stories. For many aficionados of the genre (including myself), M. R. James was the acknowledged master: he got it just right, time after time. And, at the risk of being seen merely to be repeating received wisdom, it is hard to think of a better ghost story than The Turn of the Screw by that other James – Henry. And the most renowned ghost story of our own times is, I think indisputably, The Woman in Black by Susan Hill. For here, she gets everything just right: it is an enthralling read. Sadly, her subsequent efforts have not maintained this standard: I keep reading them in the hope that she could once again capture the brilliance of her first novel in the genre, but the melancholy truth is that The Mist in the Mirror is not as good as The Woman in Black (although it is still very fine without odorous comparisons); that The Man in the Picture is not as good as The Mist in the Mirror; and that her latest, The Small Hand, is not as good as The Man in the Picture. Indeed, The Small Hand is a prime example of the ghost story that fails because it over-explains: it spends far too much on the reasons behind the haunting – the mere mechanics of the plot – rather than focusing on the haunting itself. It is curious that the author of something so consummately fine as The Woman in Black should fall into such a trap. But no matter. The Woman in Black remains a masterpiece of the genre, and one can only be thankful. 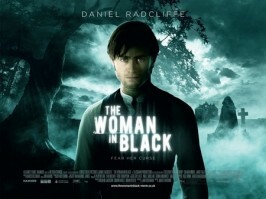 So far, The Woman in Black has formed the basis of a superb stage adaptation; a less well-known but sporadically effective television version from the late 1980s; and now, to much publicity, a film version from a newly revamped (if “revamped” is the word I’m looking for) Hammer Films. In some ways, this is a strange choice, since the Hammer films of old that we all know and love (or, at least, that I, personally, know and love) did not specialise in ghost stories as such: however, as a fan both of Hammer films and of ghost stories, this was a film for which I had to break the habit of half a lifetime, and go to the cinema to see. Cinema hasn’t really produced too many ghost stories either, once one comes to think of it. Horror stories, yes, but good ghost story films are actually quite rare. Off the top of my head, I can think of The Innocents (which to my mind is as great a cinematic masterpiece as The Turn of the Screw, on which it was based, was a literary one); the original version of The Haunting; and a rather little-known film called The Changeling. No doubt there are a few more I am forgetting now, but really, that isn’t much. For a good ghost film is just as difficult as a good ghost story: the terror must come not from what one sees, but from what one thinks one may see in the next frame. To achieve this, what one sees must be rationed. (Indeed, in The Haunting, one sees nothing at all!) The trick is to plant seeds of suggestion in the viewer’s mind. And that is difficult. That requires far more imagination than mere recourse to special effects. This film started promisingly. Indeed, some half way through the film I found myself thinking that this is very good indeed. The situation had been well set up; the design of the interior of the haunted house was superb – cluttered, dark and menacing; and the brief glimpses of the supernatural – seen, as M. R. James once put it, in the corner of the retina – were effective and creepy. This, I felt, is how a ghost story should be filmed. But the film didn’t seem to have the courage of its convictions. There’s nothing wrong with moments that make you jump: if well handled, they can be very good indeed. But if you overdo those jumpy moments, it becomes a matter of diminishing returns: once you have already jumped a few times, you become less inclined to jump yet again. The climactic sequence of Susan Hill’s story – as it was in the theatrical adaptation – is an extended sequence where the protagonist finds himself alone in the isolated Eel Marsh House overnight: here, that sequence started off very well, but ended, rather disappointingly, merely in a passage of “jumpy moments” piled on top of each other. As a result, the terror is no longer in what you think you may see next: rather, it is in what you see – and what you see, frankly, is nowhere near as frightening as what you think you might. Then, afterwards, the pacing goes all to pot. After the long sequence in Eel Marsh House, we needed the tension to come down for a while, and the temperature to settle, if only for a while. But instead, we were taken straight to a house fire, the suicide of a child, and another quite gratuitously unnecessary appearance of the Woman in Black. It was dreadfully misjudged. After the events at Eel Marsh House, the fire and the suicide did not make much impact; and the director seemed to have forgotten how important it is to ration the appearance of the ghost. Throwing out at this stage all considerations of pacing, the film then continues rather aimlessly. The sequence in which the drowned carriage is pulled out of the marsh is, once again, ill-judged, as the threat in this sequence comes not from the supernatural, but from the marsh itself: in ghost stories, the source of the menace should be kept unchanged, as any sense of menace other than that of the supernatural tends not to register in its own right, and, worse, distracts from what should be at the centre of the story. To compound it all, the film-makers seemed to think that if one ghost is frightening, then ten ghosts must be ten times as frightening: this really isn’t the case. The scene in which the ghosts of all the dead children appear, and in which Dailly sees the ghost of his own dead child (an obvious nod to the story “They” by Rudyard Kipling) may have been effective in a different dramatic context, but here, it merely serves to dissipate the viewer’s attention from the principal point. And as for the very ending, without giving too much away, it introduces a strain of sentimentality which is out of keeping with the material of the rest of the film. And by this stage, the appearance of the Woman in Black is no longer frightening: we have seen her too often by then, and have become too familiar with her presence. And inevitably, familiarity breeds comfort. So, it’s a big disappointment after all, I fear – especially after that very fine first half. If only the latter half of the film had the courage of the convictions displayed in the first. I was there last weekend. After disembarking from the boat, we walked along a pier, and then up the slope of a hill, on steps flanked on both sides by bustling cafes and by souvenir stalls. And then, we were faced with the “cave” – a large, man-made, pillared opening into the rock. Coming inside from the bright sunlight, all seems dark at first. 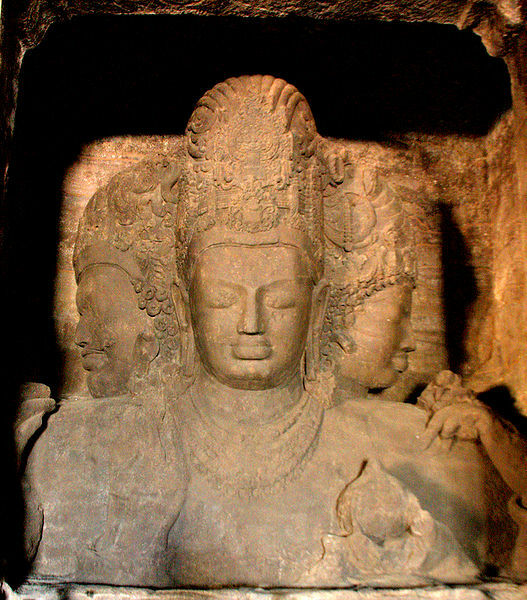 But then, as the pupils dilate, there emerges slowly from the darkness a vision – a vast, magnificent vision of Divinity, of the Trimurti, the Trinity comprising Brahma, Vishnu and Mahesh, the three faces of the God Shiva. One does not need to believe in Hinduism, or indeed in any religion at all, to find oneself overawed. After all, even many an atheist has been overawed by the vision of Sistine Chapel, or of Chartres Cathedral. And here, too, one is brought face to face, if not with Divinity itself, then, at least, with a human vision of Divinity, that is no less splendid for being human. It is a vision that overwhelms with its magnificence, and with its serene grandeur. There are times I think God is the noblest work of Man.